Since check fraud is illegal, it is impossible to place an exact dollar value on the amount of money stolen each year through fraud. By all accounts, however, the problem is measured in the billions of dollars annually and continues to grow each year. This post provides basics facts and information that describe the scope and pervasiveness of check fraud. The FBI estimates that losses from check fraud total $18.7 billion annually. More than 500 million checks, more than a million a day, are forged annually in the U.S.
Because of demands on law enforcement, prosecutors fail to pursue 75 percent of bank check fraud cases, leaving most matters to be settled between the involved parties, and placing even greater emphasis on the concept of due diligence. The average fraud scheme lasts 18 months before it is detected. The most common method for detecting fraud is through tips from employees, customers, vendors and anonymous sources. The second most common method of discovery is by accident. Chemical washes are used to remove toner so that new information (e.g., larger check amount, different payee) can be printed. Relyco’s DETERACHEK® and ULTRASEAL® 100 products are printed on safety paper with a multilanguage chemical void and/or solvent reactivity, so exposing either product to most chemicals will cause indelible staining, rendering the paper useless to thieves. Relyco’s MAGNACHEK®, BASICHEK®, and FUTURACHEK® lines are also printed on safety paper to inhibit chemical tampering. Toner lift off removes toner using a razor blade or adhesive tape. Relyco’s DETERACHEK, ULTRASEAL 100, MAGNACHEKand BASICHEK lines feature toner adhesion enhancement (or “toner grip” or “toner anchorage”), which helps prevent toner removal. The mass duplication of a check through photocopying allows many checks to be cashed at different banks. Features like copy-void pantographs, microprinting, simulated watermarks, fluorescent fibers and two-color gradient pantographs make undetected photocopying of both the DETERACHEK and ULTRASEAL 100 extremely difficult. 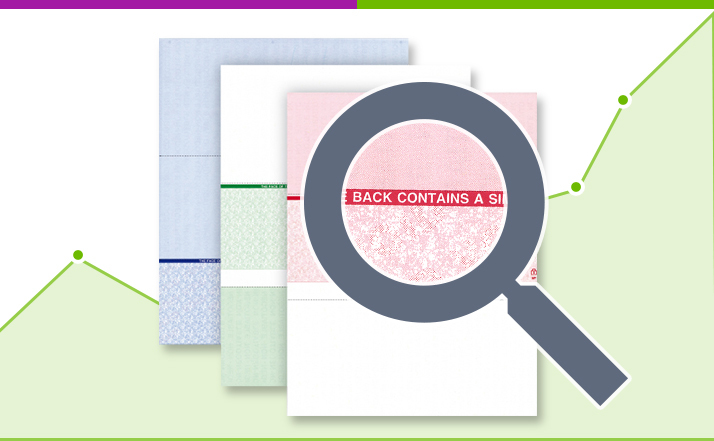 All Relyco cut sheet stock laser checks and pressure seal check lines, including ULTRASEAL, BASICHEK, MAGNACHEK and FUTURACHEK, contain copy voids, microprinting and other document security features designed to hamper fraudulent attempts at photocopying and duplication of checks. What if someone does not use one of your checks at all? Rather, they simply steal your information and print on totally different check paper. By setting the precedent that your institution uses the most secure check paper, you can clearly distinguish your organization from the criminal. Undoubtedly, the criminals will not use high-end security check stock. When dealing with the aftermath of the fraud, you can tell your bank that you do in fact use high-security check paper. The checks that the criminal used clearly are not equal to the standards that you use. By doing this, you can clearly demonstrate that have done your due diligence. Relyco can provide you with secure check printing solutions to help you maximize your institution’s efforts to prevent becoming another check fraud statistic. To learn more about secure check printing solutions from Relyco, call 1-800-777-7359 or email info@relyco.com.